We are all about the styling, particularly with our elopements, and this supreme styling was a combination of us and wonderful amanda. Could there be a better combination? (‘friends’ reference intended…). Let’s start in my favourite place… the flowers. 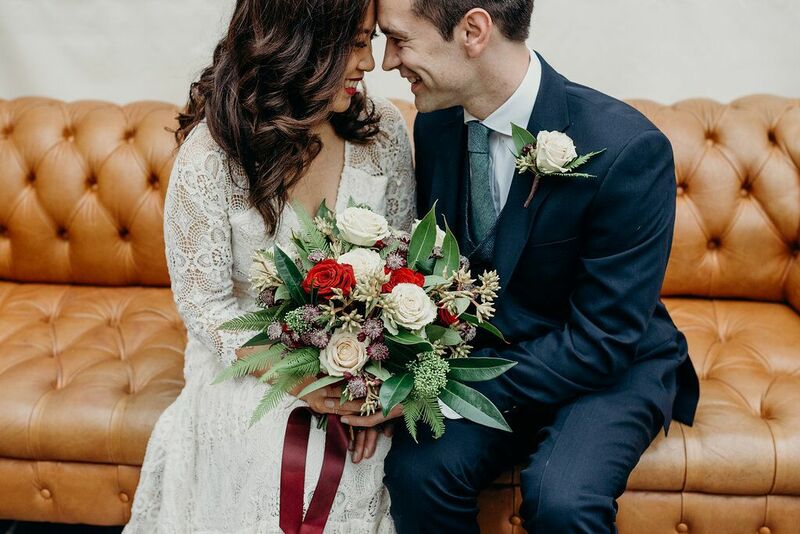 Amanda’s flowers are (lets face it) always supreme, but I especially loved the way michelle’s flowers stood out, and the large bouquet against her delicate ivory lace dress gave a real ‘wow’ factor. and not forgetting jonny’s buttonhole! Okay so if the flowers and the cake weren’t quite enough, check out their table scape!(!!) Amanda put huge amounts of effort into creating a wonderful long centrepiece. We’re talking moss, succulents, sliced logs, roses, and roses under glass (beauty and the beast alert! ), candle arbours, autumnal foliage… the list goes on! Anyone else feel like the candle arbours are going to come to life any minute…? To finish off the styling, we used our (perfectly matching!) red charger plates with taupe dinner plates and grey napkins, sitting on top of our green tablecloths. The final touches were the antique-gold cutlery and clear crystal glasses which gave the table a well balanced banquet-style look. Michelle & Jonny brought place names which were an absolute perfect match to the rest of the styling; great effort by all! We popped Michelle’s bouquet in a round bark vase which sat at the head of the table, perfectly matching the entire theme. Finally, here are some photos of the lovely couple themselves! For more elopement styling, check out our previous blog post from clare & simon’s wedding. Next Post2020 wedding dates open for booking in 6 days...!